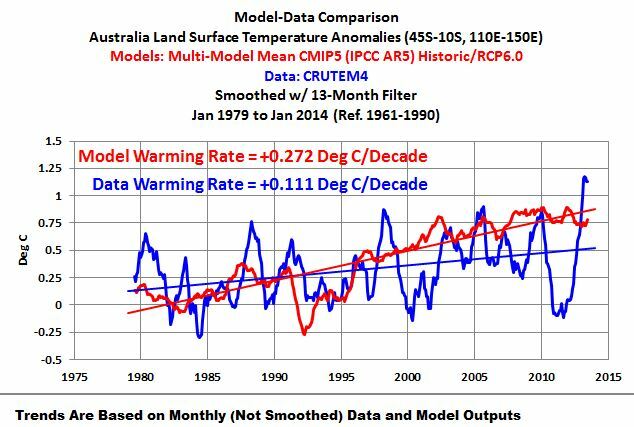 The IPCC’s latest suite of climate models overstate, by more than double, the actual warming in Australia from January 1979 to January 2014. This is the conclusion from expert analysis by US-based independent climate researcher Bob Tisdale. 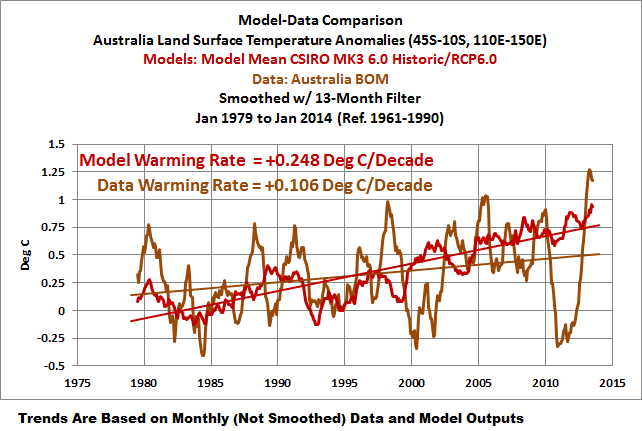 At Quadrant’s request, Tisdale has now updated graphs for Australia from his 2013 book Climate Models Fail. Tisdale, with a background in fluid dynamics, has published two other e-books on climate models and global warming, and regularly contributes to the world’s top-ranking climate blog, Watts Up With That. The models’ overstated warming on a global basis is no longer contentious. As even the 5th IPCC report acknowledges, from 1998-2012 the simulations of 111 out of its 114 climate models exaggerated the global warming trend. The IPCC blames a variety of factors, including natural variability, solar, volcanic and aerosol impacts, and over-cooking of the all-important climate sensitivity to CO2 increases. So much for ‘settled’ climate science. 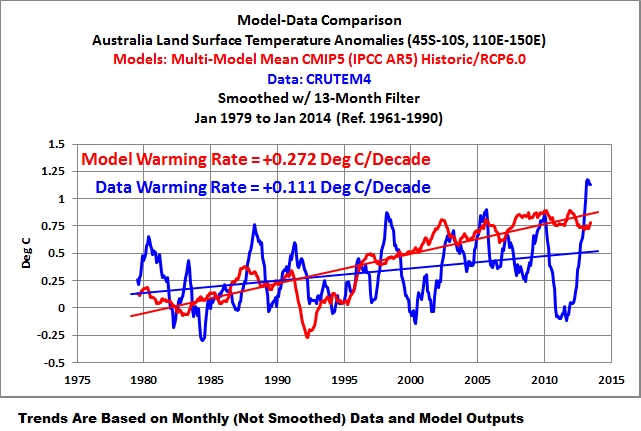 Tisdale’s graphic for the Australian mismatch between IPCC modelling (red) and reality (blue) is below, including the warming rate trend lines. The latest suite of IPCC models (CMIP5) actually performs worse for southern regions (and globally) than did the previous generation of IPCC models (CMIP3), says Tisdale, who also has checked the performance of the latest CSIRO Mark 3 6.0 climate model (red), documenting its mismatch with Bureau of Meteorology actual temperature anomaly data (brown). 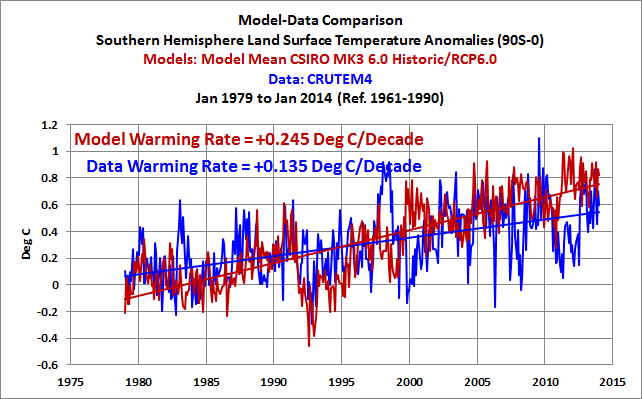 Tisdale says, “The CSIRO model more than doubles the observed warming rate for Australia since 1979. It’s not as bad as the mean of all of the models used by the IPCC, but more than doubling the actual warming rate is still a very bad performance, especially apropos of the CSIRO’s own country.” The CSIRO model also fails in assessing warming rates for the whole Southern Hemisphere land masses. It gets the rate too hot by a factor of almost two. [graph below]. By way of consistency, the IPCC model suite does the same. For shorter-term Australian temperature data, Tisdale has plotted modelled the forecasts for Jan 2001-Jan 2014 against actual records and found the IPCC under-estimates warming rates in Southern Australia while over-estimating rates in Northern Australia. But he says the period is too short, and natural volatility too great, to make useful comments about the latest decade. 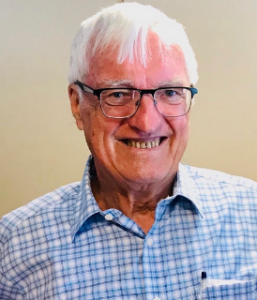 No modeling has been able to predict El Nino and La Nina events with regularity in the tropical Pacific more than a year in advance, so modellers will find the task of forecasting Australian climate for a single decade to be impossible, he says. Australian taxpayer-supported climate scientists are certainly not trumpeting the mismatch between the models and the Australian temperature data. The exaggerated-warming outputs of the models have been the primary input to much of the “science” that underwriting predictions of looming catastrophe. For example, many state and local authorities have adopted IPCC model-based estimates of a half-metre sea-level rises by 2100 by adding their own ad hoc estimates, and amending their building codes to deal with an assumed risk of 1-metre rise. (Bad luck, coastal developers). The Melbourne University-based Australian-German College of Climate and Energy Transitions has an executive body replete with alarmists, including Professors David Karoly and John Wiseman, as well as a board member of the activist Australian Conservation Foundation, Dr Peter Christoff. (The ACF says Christoff has ‘fought to stop global warming’. Good for him!). The College has ten Ph.D. projects listed on its website. Of those, three explicitly input the latest and faulty IPCC CMIP5 models. Tisdale says that climate modeling groups like the IPCC and CSIRO will always try to present and place their models in a favorable light. But there are numerous peer-reviewed papers and letters to scientific journals by climate specialists which highlight the many flaws in those models. The papers examine how poorly the models simulate variables such as the El Niño and La Niña ocean processes, the atmospheric response to volcanos, precipitation, and sea-ice extent. Tisdale has prepared step-by-step instructions that allow readers to confirm how poorly models perform.